Thanks to a two-year grant from the Richard M. Schulze Family Foundation, the Taste of Immokalee (TOI) Summer Internship Program once again is open to all Collier County students. 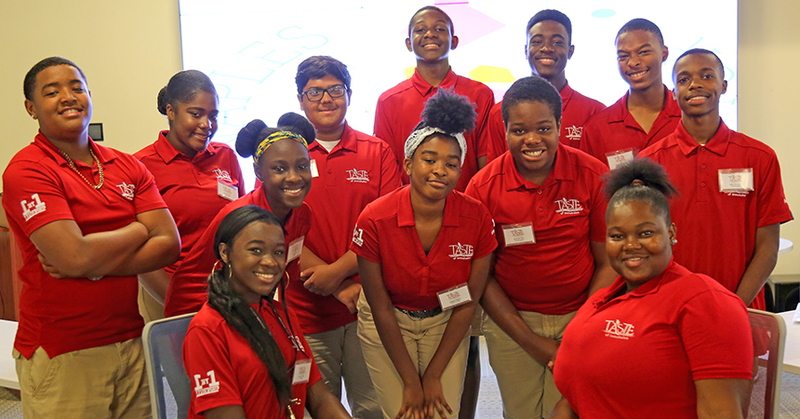 This year, the TOI Summer Internship consists of 17 paid interns, representing Immokalee, Palmetto, Gulf Coast, and Naples High Schools, who receive mentoring and business education along with hands-on experience running a company. “During the summer program lasting June 6th through August 2nd, the interns are running the company. They are doing everything from human resources, finance, accounting, payroll, inventory, branding, and marketing,” explains Administrative Assistant Yvelande Astreide. Taste of Immokalee products can be purchased online and are available in 18 Publix stores in Collier County. This summer, with a launch of new products, the TOI team is working toward getting their products into Lee County Publix stores, as well. The Taste of Immokalee products will also be sporting a new design thanks to a branding effort visually linking Immokalee agriculture with their products. Although the Taste of Immokalee program attracts future business leaders and entrepreneurs, the mission statement and vision as a benefit corporation attracts students with the desire to help their community. “I have always had a passion for helping people. That’s why I want to become a nurse practitioner. When I heard about this program and how it helps the community, that’s why I want to help out,” expresses TOI intern Abigail Metayer. A portion of all products sold go directly to the Immokalee community. The interns also work on fundraising efforts with baskets sold at Christmas and the Super Bowl with all proceeds benefitting various needs in their community. Last year, TOI raised $10,000 for Hurricane Irma Relief in Immokalee. As the answers to that powerful question began to unfold, Taste of Immokalee was born. Founded by the 1 By 1 Leadership Foundation, Taste of Immokalee has grown into a successful social enterprise model. Under the guidance of mentors and business professionals, students create and sell delicious products inspired by the abundance of fresh produce in their community. Every product purchased reflects their culture, family recipes, and hope for an end to poverty in their community. For more information, visit www.tasteofimmokalee.com.